Ilse was born in Durban, South Africa and grew up in KwaZulu-Natal, mostly in Pietermaritzburg, and presently lives with her family in Tzaneen, Limpopo Province. “Although I was always considered relatively talented and always enjoyed drawing, my artistic abilities were never really recognized, nor was I ever encouraged to pursue art”, says Ilse. Making a career as an artist wasn’t even part of her wildest dreams. Coming from a relatively conservative Afrikaans background with more secure roots as educators rather than artists, Ilse attended university to study to become a teacher. She completed her B.A degree and Diploma in Higher Education at Bloemfontein University. “There, I also met the love of my life and husband, Abraham de Villiers, who completed his B.Agric. degree in 1985”. Once they started a family, it didn’t seem worthwhile for Ilse to continue teaching. “I was always busy on the farm producing something, if it wasn’t sewing clothes or gardening, I was baking.” Whenever she could be creative, she was happy. By 1996, they had three children: a son of five, a daughter of four, and a six-month old boy, when in August a terrible tragedy struck the family. “After some months of trying to put our life together again, a dear friend and neighbor suggested I try my hand at painting. At that stage, fabric-paints were the latest craft-craze, and I reluctantly gave it a try”. Ilse found creative expression therapeutic and began spending more and more of her time painting, “And that was the beginning of my life story as an artist”. In 1997, the family relocated, this time to northern KwaZulu-Natal where their maize/wildlife-farm was situated close to the Ithala Nature Reserve. “Abraham and I always loved the bushveld and nature in general”. It was only a matter of time before they befriended Ithala’s management and game rangers. “They quickly learned that I painted, although it was mainly funny birds, fruits and flowers at that stage”. Then one of them asked if she would mind painting them a lion. “In fact, that was my very first wildlife art commission!” Ilse was very reluctant at first and clearly told her first client, “I don’t paint animals”. But her husband persuaded her to give it a go, and she was pleasantly surprised by how satisfied she was with the result. “It inspired me to try my hand at a Cape buffalo and a yellow-billed hornbill”. And, as they say: “The rest is history”. Through the use of acrylic on canvas, she creates a new world by skillfully harmonizing wild animals into a natural colourful reality. In 1998, Ilse bought her first “serious” art materials: canvases and professional-quality acrylics. “Slowly, I made the transition from casual painting-for-fun to the realistic depiction of wildlife”. “I’ve always been a bit of a perfectionist and painting animals exactly as they are in nature has always been my mission”. Ilse has come a long way since 1998, and “I’m now very proud of how my technique has developed and my style has grown”. To this day Ilse still hasn’t had any professional art-school training, “Although I would have loved to have had that opportunity, I know my path to become an artist happened exactly the way it happened for a reason”. That reason is that her work is pure ILSE, never influenced by anyone else’s ideas or judgment of what is “right or wrong” or “acceptable or not”. “I truly paint from the heart”. She also does research using professional picture libraries such as AfriPics where she purchases the rights to use high-resolution pictures as “once-off usage as artist reference”. Otherwise, she uses their own photos as reference (although she readily admits her husband is a much better photographer than she) or those of friends, family, and other wildlife enthusiasts. Ilse is always looking for outstanding photos, as well as opportunities to visit the bush personally to build her own wildlife photo references. In March 2014 she and her husband had the wonderful opportunity to go on a “Big Cat Safari” to Kenya’s Maasai Mara with professional wildlife photographer Daryl Balfour, his wife Sharna, and the Wildphoto Safari team. In addition to hosting his 5-star safaris to the Maasai Mara, he decided to set up two 2015 safaris in collaboration with Ilse: A “Big Cat Safari” (15-22 March 2015) and a “Migration Safari” (22-29 August 2015) for eager photographers, wildlife enthusiasts and art lovers who want to experience the magic of the Maasai Mara with Ilse and the Wildphotos team. Since 2008, Ilse exhibits regularly in the United States at Charleston, South Carolina’s Southeastern Wildlife Exposition (SEWE). 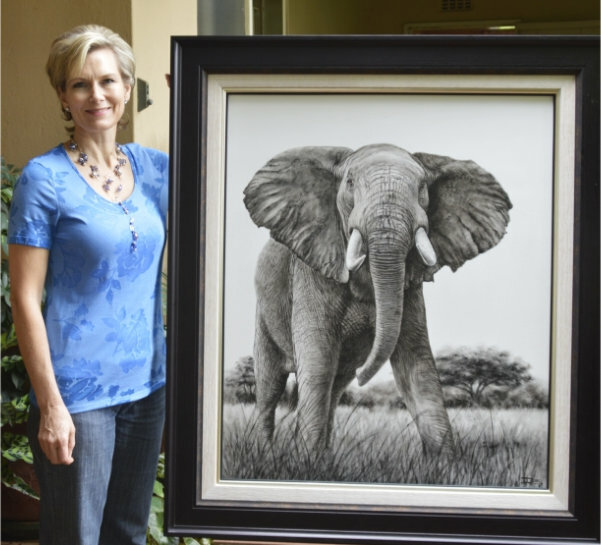 She has also shown her work at the Safari Club International Michigan Chapter, and at the annual wildlife art show Natureworks in Tulsa, Oklahoma. Decoys and Wildlife in Frenchtown, New Jersey also carries her work. 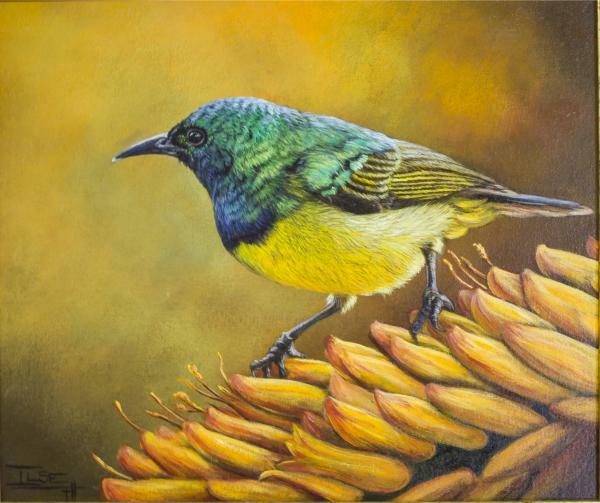 In South Africa, she has exhibited at the Aardklop and Innibos art festivals and the Bundu Expo. She now exhibits annually at the Getaway show and Huntex. “My work isn’t sold in any other galleries, and there are no prints or reproductions of my work , only original paintings. I realize I probably would have made “a name” sooner if I’d used an agent or worked through galleries, but I prefer the personal touch of clients contacting and buying from me personally. I’m proud to say that I have wonderful friends and a solid client base, both in South Africa and abroad, who love my work and support me in all I do”. A doting animal lover, from family pets, including two Rhodesian Ridgebacks, a Jack Russell, and her “painting partner“, a very talkative African grey parrot named Asjas, to wild animals everywhere, “It is my heartfelt belief that artists can make a huge difference in making people aware of conservation and the plight of different species on our planet.” Ilse is a member of AFC-Artists for Conservation and has twice donated paintings to be auctioned off to raise funds for rhino conservation and to the Perth Zoo in Australia for their Silvery Gibbon Project.